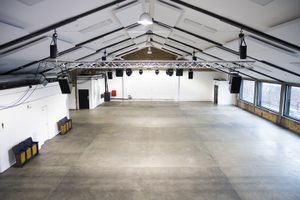 Oval Space is a multi-purpose venue with over 6000 square feet of unobstructed statement space, in a unique London setting. 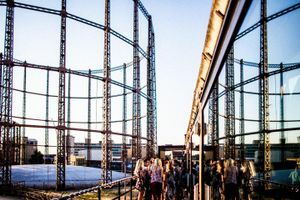 The location is adjacent to the iconic Bethnal Green gasholders, along with the volume of space we offer and the versatility of our layout, have helped us become one of the capital's most in-demand event destinations. Recently the terrace has transformed the area and there has been a covered structure installed, complete with living plants, a cutting-edge sound system for outdoor receptions, bar facilities and a large barbecue with extraction for those all important al-fresco dining events. The venue features multiple breakout rooms, a green room and a mezzanine area. Oval Space is used for all kinds of events from corporate functions, product launches, conferences and fashion shows, through to small and large-scale stills, TV and film shoots. The closest tube stations are Cambridge Heath Road (3 minute walk), or Bethnal Green (7 minute walk). Liverpool Street is only 8 minutes away by overground and foot, with connections on the central line. Capacities at Oval Space are as follows: 900 standing reception, 400 theatre style, 350 dining, 250 cabaret. The space can also accommodate 100 guests on our summer terrace.